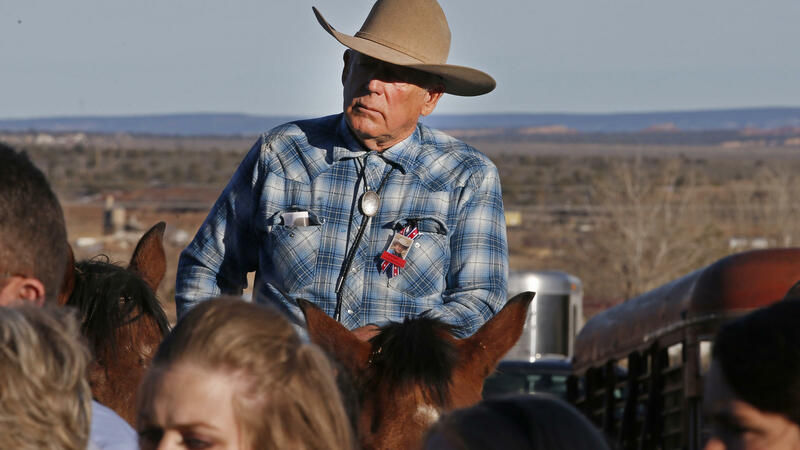 Cliven Bundy rides a horse after attending the funeral of of fellow rancher Robert "LaVoy" Finicum in February. Vickie Simmons, vice chair of the Moapa Band of Paiutes, wants a guilty verdict for Cliven Bundy. She believes he doesn't respect other uses of public land in southern Nevada. Jury selection began Monday in the high profile case in federal court in Las Vegas. Bundy, 71, along with two of his sons, Ammon and Ryan Bundy and independent militiaman Ryan Payne, are accused of assault on a federal officer, carrying firearms in relation to a crime and other felony conspiracy charges. This week's proceedings cap an almost dizzying array of drama since the initial standoff. Ammon and Ryan Bundy and other anti-government militants were acquitted for staging an armed takeover of the Malheur National Wildlife in Oregon, an event that was inspired by the Nevada standoff. And there have since been several more failed attempts by federal prosecutors to convict some of Bundy's lower-level associates in Nevada, which have included hung juries and acquittals on certain counts. All of this means prosecutors are under enormous pressure to get a conviction in Las Vegas. Joan Anzelmo, a retired federal land manager and frequent Bundy critic, says an acquittal of the family patriarch and his closest associates would send a chilling message to federal employees in the West. "People are going to take notice and say, why are we doing this job, why are we taking care of these places when federal laws can be ignored," Anzelmo says. The Bundys' self-described "range war" over control of federal land began as a fight about ranching. They're descendants of Mormon pioneers and have long refused to recognize the federal government. They're also some of the last remaining cattle ranchers in southern Nevada, as land has been squeezed by booming development in Las Vegas as well as the expansion of solar development and tougher environmental protections. After the 2014 standoff, it quickly became clear the confrontation was about a lot more than ranching, attracting the attention – and support – of various factions of the far-right movement; a kind of a precursor to the anti-establishment sentiment that supported Donald Trump. "There is a serious amount of government overreach in general and especially here in Nevada when it comes to our lands," says John Moore, a former libertarian state legislator and Bundy family friend. "I'm a firm believer that it's the state's land not the federal government's." A litany of prior court rulings and treaties actually reinforces that federal control. When Cliven Bundy first appeared at his arraignment last year, he refused to even enter a plea because the rancher doesn't recognize the federal court system. His supporters and other defense attorneys have since backed away from that claim, arguing that the standoff was just a protest and that guns were only drawn in self-defense. "Their claim has changed," says Ian Bartrum, law professor at University of Nevada, Las Vegas. "It goes from there being no federal government, to there is a federal government and it protects my right to bear arms, to waiving the Constitution around when it's the Constitution that's really their problem." Until now, Bartrum says the Bundys also have seemed to depend on sympathetic jurors who either thought the government's charges were too severe or identified with the defendants' anti-government, anti-establishment views. There is one potential game changer: the shooting massacre earlier this month at a country music festival on the Las Vegas strip. The gunman in that unrelated incident, Stephen Paddock, lived near the Bundy ranch. And the massacre has raised new questions about whether a high profile trial where men are defending their use of guns will be tougher to win now. The defense filed motions to move this trial at the last minute but they were denied. "They're going to be talking about the Second Amendment I think is their point and this is a bad time to be talking about the Second Amendment in Las Vegas in glowing terms," says Bartrum. One thing is clear, the stakes are abundantly high. If Cliven Bundy is acquitted in Nevada, like his sons were in Oregon — will others interpret that ruling as permission to take up arms against the government when they don't like a land policy? For many residents who live in the desert lands near the Bundy ranch where the family's cows continue to roam illegally, it's been a tense three years. Until recently, federal land managers weren't even doing work in the area due to safety concerns. And some see the trial as a potential closure. 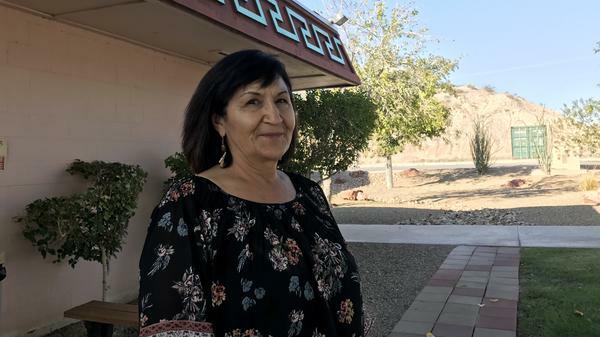 "I seen him riding around here after that [the standoff] in a Cadillac and he had bodyguards," says Vickie Simmons, vice chair of the Moapa Band of Paiutes. Bundy used to lease land from her tribe to grow melons. But she says he never respected her people. And she can't help but wonder what would have happened if Native Americans had been the ones pointing guns at federal officers that day. "He needs to pay for it," Simmons says. "That was wrong what he did, nobody should be able to pull out their guns and threaten and scare everybody the way they did." Were those guns drawn to threaten federal land managers who were trying to do their job and enforce the law, or was it merely, self-defense, an act of protest? That's the question that will soon face the jury. Jury selection in the USA v. Bundy case is expected to last most of the week. With some 40 witnesses already scheduled to testify, the trial could last several months.